Android 4.3 release date: when will you get it? Android 4.3 Jelly Bean is old news, Google has already launches its successor in the form of Android 4.4 KitKat, but most devices are still waiting for 4.3 to arrive on screen. Manufacturers are slowly getting round to sorting out their Android 4.3 updates and we're keeping tabs on them every step of the way. While Google's fleet of Nexus devices were the first to receive the Android 4.3 upgrade, they have now been moved onto KitKat so our focus lies with the likes of Samsung, Sony, HTC and LG. The five star HTC One has already been pushed the Android 4.3 update (plus a bump to Sense 5.5), so if you're still slumming it on Android 4.2 head over to the settings menu and check for a software update, meanwhile the Google Edition of the handset (that's the one running pure Android) is already rocking KitKat. If you picked up the mammoth 5.9-inch HTC One Max you'll have been enjoying the fruits of Android 4.3 since you took the phone out of its box, as it shipped with the latest version already installed. For any HTC One Mini owners out there you've had to wait a little longer for an Android 4.3 upgrade, but HTC has finally started to push it out, so if you're not on it yet it should be arriving soon. Sadly there's currently no information on whether the budget focussed HTC Desire 500 will be upgraded to Android 4.3, but considering it's still running Android 4.1.2 we're not overly hopeful. Samsung has been having a bit of a tough time with the Android 4.3 Jelly Bean update, with issues arising on both the Galaxy S4 and Galaxy S3 when it tried to roll it out the first time, which led to the Korean firm pulling it for a short while. The good news is that the roll out has recommenced, hopefully with a more stable version of Android 4.3, so if you're rocking a S4, S3, Galaxy S4 Mini or Galaxy Note 2 check out software updates in the settings menu. Global software roll outs can take a while, so you may not see Android 4.3 appear for a few weeks, or even a couple of months - so be patient! For those of you wondering where the Galaxy Note 3 support is don't fret, the phablet already comes running Android 4.3 as standard. Sony is yet to start rolling out Android 4.3 to handsets, but the Japanese firm has at least announced which devices will be treated to it, and given us a clue as to when it will start to arrive. "We're already getting stuck in and can confirm we'll make Android 4.3 available for: Xperia Z, Xperia ZL, Xperia ZR, Xperia Tablet Z, Xperia SP and Xperia Z Ultra and Xperia Z1 from December 2013." This isn't a complete list of devices which may be treated to the latest version of Jelly Bean however, with Sony also revealing that it was planning on "uplifting some of our other devices running 4.1 direct to 4.3" - so watch this space. We expect the LG G2 and G Pad 8.3 to both be boosted to Android 4.3, but the Korean firm is not giving too much away with a spokesperson telling TechRadar: "LG is keen to ensure that its handsets run on the latest software, but at this time cannot confirm which handsets will support Android 4.3." 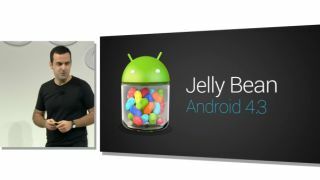 We're chasing all the other manufacturers to find out what their plans are for the latest version of Jelly Bean and we'll update this article once we find out. Motorola is sitting pretty when it comes to the Android 4.3 update, with the incredibly good value Moto G already rocking the software as well as having a KitKat boost lined up in early 2014. The US-only (for now, at least) Moto X isn't getting an Android 4.3 update, but that's because Motorola has decided to jump straight to KitKat - nice!